The Kitsap Pumas, a professional soccer club located in Bremerton, Washington, will look to clinch their second straight Premier Development League (PDL) Northwest Divisional Title this Wednesday night at Gordon Field as they host the second place Portland Timbers U23s. The Pumas, who lost in the PDL national final last season to the Michigan Bucks, only need one point out of their remaining three games to clinch the division championship and seal their return to the Western Conference Finals later this month. “It’s certainly a good position to be in at this stage, but we aren’t taking anything for granted,” said Head Coach of the Pumas Cameron MacDonald. The experience of the Puma’s roster has been a contributing factor to their success thus far. They have returned eight players from the squad that won the Western Conference Championship last year by beating Ventura County Fusion in penalties and FC Tucson by a score of 3-0. 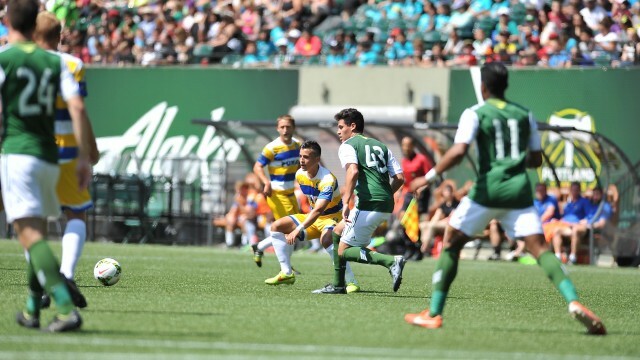 The Pumas have gone 8-0-1 in league so far this season, including a 2-0 win against Portland in front of a crowd of over 8,000 fans in Providence Park on May 29th. The only time the club has dropped points all season came in a toughly fought tie in Calgary after an exhausting day of travel. While Kitsap somewhat struggled to produce goals earlier in the season winning most of their games by only one goal, they have unleashed a fury of goals over their last two games that has allowed them to cruise to two blowout wins against both Lane United (won 4-0) and Washington Crossfire (won 4-1). Along with his game-winning goal at Portland earlier this season, Miller joins forward Michael Chamberlain for a share of the team’s lead in goals with five. The defense of Kitsap has surely done their job in helping the Pumas stay undefeated as well by only conceding three goals all season, which puts them atop the entire PDL in terms of goals allowed. There is a three way tie for second between Des Moines Menace, Charlotte Eagles and Midland/Odessa Sockers FC who all have six. As the Pumas head into their matchup against Portland this Wednesday night at Gordon Field at 7:00 p.m., they will undoubtedly look to continue to build off their success and clinch the division in front of their dedicated home fans. Tickets will be available for purchase online and at the door so be sure to come out and celebrate what would be the club’s fourth Northwest Divisional title in only their seventh season as a club. This Wednesday night is sure to be special so do not miss your chance to come out and witness your Pumas try to make history.